One of the FLF Co-Vice Chairs, Nicole Beasse, will be giving a talk on Wednesday, March 19th, in room 207 as a part of the Philosophy Club’s discussion series. The talk will be a feminist critique of ‘the reasonable person test’, specifically in the context of tort law. 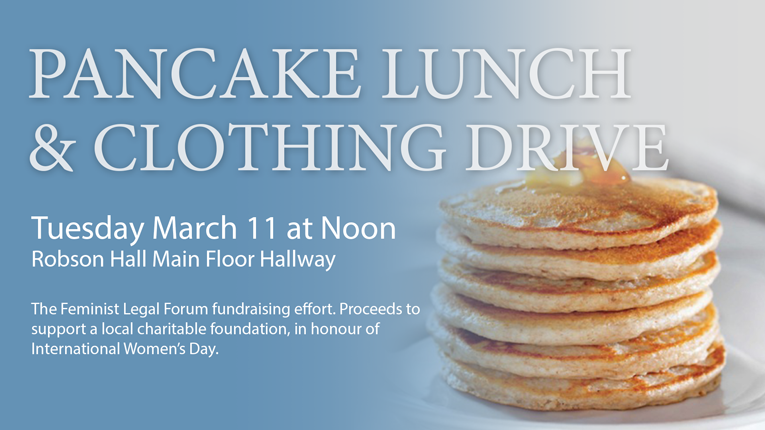 In honour of International Women’s Day (which just happens to be today, Saturday, March 8th) the FLF is doing a Pancake Lunch on Tuesday, March 11th, in the main hallway at noon (feel free to checkout the lovely picture for the event I have attached to this email). The proceeds of the lunch will be going to the Elizabeth Fry Society. On Tuesday, March 11th, at lunch we will also be collecting clothes for the Elizabeth Fry Society, as they have a wonderful set-up which aids women recently released from prison. These women often need nicer clothing to attend court dates and job interviews and the Elizabeth Fry Society tries to provide them with this type of clothing. If you cannot drop clothes off on Tuesday let us know and we will try to make other arrangements for you. 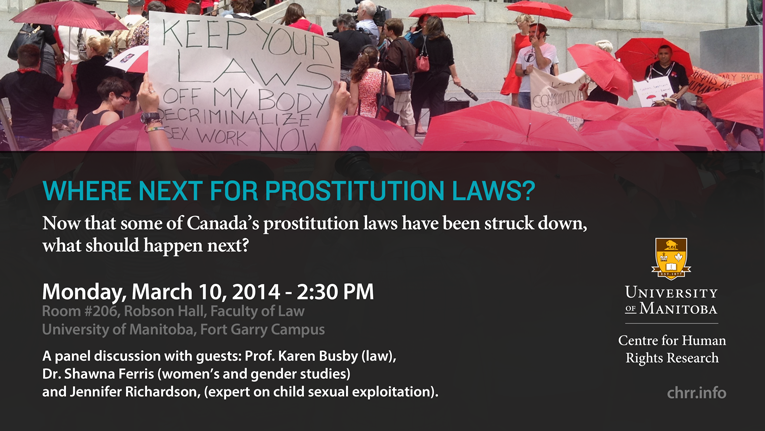 Finally, just a reminder that on this coming Monday (March 10th) at 2:30pm, in room 206, Professor Busby is hosting a panel discussion entitled “Where Next For Prostitution Laws?” The recent SCC Bedford decision has struck down some of Canada’s Prostitution Laws and the panel will discuss what should happen next. Saturday, March 8th, is International Women’s Day! 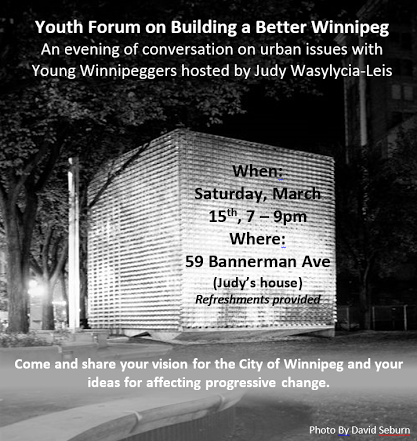 The attached PDF shows events going on around Winnipeg to mark the occasion. Our speaker from a few weeks ago, Judy Wasylycia-Leis, asked us to share this with all of you. If you have the time you should definitely try to make it out! Community Outreach has partnered with the Elizabeth Fry Society and are currently seeking Court Support Volunteers who have an interest in assisting women and their families at the Winnipeg Law Courts. On October 3rd from 12:00-1:30pm anti-choice advocates will gather at the Legislature under the auspices of DEFUNDING ABORTION SERVICES in Manitoba. A counter-presence is being coordinated at the community level to demonstrate that there are Manitobans who respectfully disagree (and we are the majority) and that the ‘public’ does not get to hand-pick which medical procedures are necessary and/or funded based on fundamentalist and woman-controlling positions. WHC will be there – along with the Reproductive Rights Action Group and the Women’s Committee of the Manitoba Federation of Labour (who issued a Call to Action to all of their members, too). INVITE YOUR SISTERS, MOTHERS, AUNTIES, FRIENDS, COLLEAGUES, CLASSMATES….WE MUST SHOW UP AND OUTNUMBER THE ANTI-CHOICE CROWD…costumes, placards, banners, noisemakers, and other creative elements are welcome!